The Kenda Nevegal Pro tire is no stranger to praise. 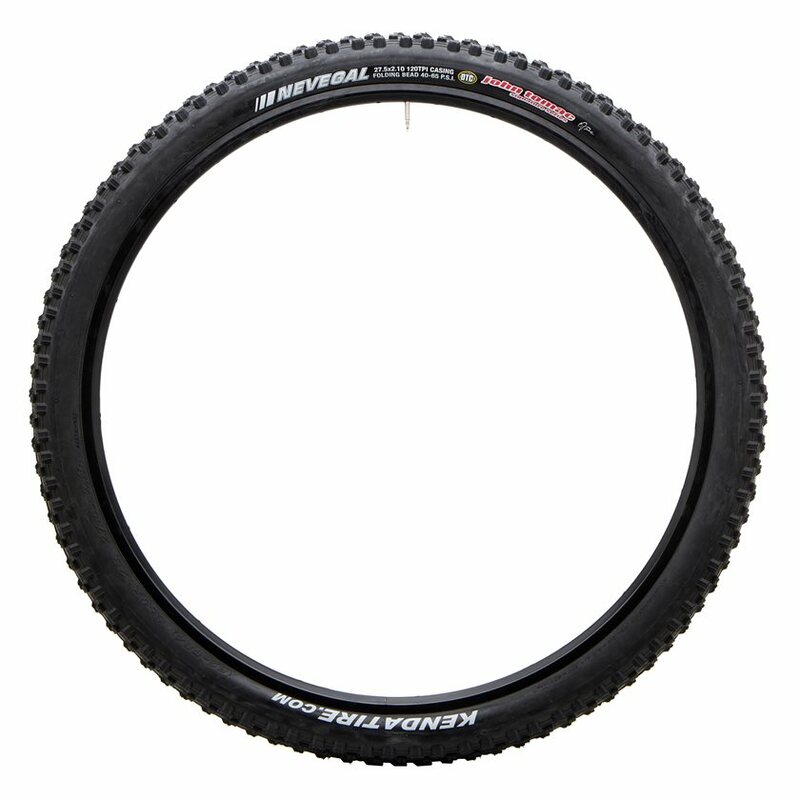 For years, the Nevegal Pro has consistently been voted a winner by Mountain Bike Action Magazine and for good reason. Part of the John Tomac Signature Series, this model of the Nevegal Pro features Kenda's Dual Tread Compound which uses the L3R Pro compound (60 shore A durometer) in the center and the STICK-E compound (50 shore A durometer) for the corning knobs. The L3R Pro compound will improve the center tread life while the STICK-E compound provides plenty of grip and control when corning fast downhill turns. The tread pattern on the Nevegal Pro is perfect for hard-packed, rocky, dry terrain, however, also works well in slightly muddy conditions. The center knobs are ramped to provide traction while maintaining a low rolling resistance and the tall side knobs are designed to penetrate and hold on loose terrain. Tubeless Ready?DTC is Non-tubeless. Only SCT (Sealant Compatible Technology) type tires are compatible with sealant. Please Note: Kenda does not endorse the use of any fluid-based sealant products in any Kenda tube-type or UST tubeless tires. Sealant is only compatible with SCT (sealant compatible technology) type tires Use of any fluid-based products will void any warranty claims. Got this for my son to try. He has tore up 2 Maxis tires in the last 5 months (about $70 each). He rides a Santa Cruz Bronson 27.5 in the Phoenix Mountain Preserve area. Trails like 100, 1A, 8, 304. Most are extremely rocky. When we first got the tire the sidewall seemed too thin but it has been fine so far-about 25 miles. Time will tell. Have had this tire on since spring '14 and have no complaints. Only thing I wish is that I could try running tubeless, but since I knew that going in, it's not a knock to the product. I've been riding in Washington and California and have had great luck with durability, tread and traction in wet or dry conditions. This weekend will be the test in rainy conditions. I maybe have 150 miles on them and the tread seems in good condition still. 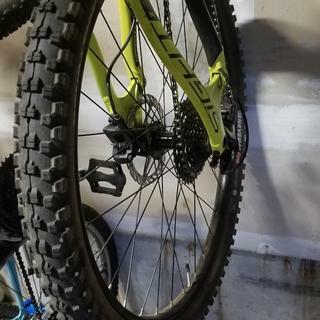 New to mountain biking and was replacing my old Maxxis Tires. I found these on clearance. I have been out riding on them twice. Perfect Traction. Best front tire for a 650b 27.5" wheel mountain bike. Great traction, very reliable entering corners fast. I had this on my 2008 Giant and ordered this for my 2013 KHS 650b. I LOVE IT. 4 bikes, all with Nevegals..
the 2.1 Never Rolls are great for 650b conversions for the rear. Its low profile fits nicely with an average of 1/4 to 5/16" space between tire and lip of the frame. I tried the 2.35's and they are a tad too tall so I swapped them for the front with a 650b fork. The 2.35 do fit the rear but its too much of a tight squeeze. Like sharing a cab with 4 people---fits but not comfortable. The price is right too, most 650b tires are $50. These are $10 bucks cheaper---wow, let's put a down for a house. But saving even 10 bucks is better than nothing. I'd get a pair before the price goes up. These tires are great. I ride a mix of dirt and rocky trails, the traction is awesome. I am running tubes at this time because my rims didn't work well to a ghetto tubeless setup, which I know is not the tires fault. I haven't had a flat or loss of air yet in a couple hundred miles. Overall I love these tires, my riding buddy replaced his at the same time with them as well he is very happy with them also. love kenda nevegal dtc's. have them on two bikes now. they work really well and seem to wear well. nice and grippy on the trail. Many that I ride with tell me that these tires don't work well. I have tried many other brands and models but I keep coming back to the Nevegal. It's affordable, it lasts a long time and ouch flats are rare with them. The side wall holds up nice. Kudos KENDA for producing a great tire! Well I ran my Maxxis Pace first. Maybe in a few months I will try this tire unless something else happens. I ran Nevegals for years with no complaints then the last two years I've been on Maxxis High Rollers. Going back to Nevegals I realized they are just as good as the Maxxis as far as traction and durability for a lot less money. They set up tubeless easy. Best tire youroney can buy. These Nevegals work well in all conditions and last more than just a season. These Nevegals make my Norco Sight perform at it's best. Weather in the dirt or on the street. Bit on the thin side, but great traction at a great value. Fast when fast. Grippy when grip needed. I use this on the rear of my all mountain bike that I mostly ride XC on with some intermediate DH a few times a year. They're great riding DH! They're overkill riding XC for the most part but knobbies help a slow, fat guy crawl over roots and rocks when I get tired and lose momentum. I've been using these tires for several years and have tried others but keep coming back to the sealant compatible Nevegals. Great tread design and compounds give good traction, especially while corning, and longevity. My preference for tubeless is to use sealant but to use it without voiding the tire warranty and possibly compromising the tire you have to get the SCT version designed for sealants. For everyday riding I'll typically move the front to the rear and put a new tire up front. I've been patiently (not really) waiting for these to go on sale and found them at a great price with Jenson so I bought 4. Been riding Rocky Mountain trails for 25 years. Current bike is a Santa Cruz Carbon Bronson, Fox Susp, XX1 drive, XT brakes, Enve bars, stem & 60/40 wheels, DT Swiss 240 Hubs, RS seats post. Worked for my Moab trip. I bought this tire for a trip to Moab. It was grippy and did what I wanted. No flats or problems. Felt great riding it. Did a little over 30 “Moab” miles on it. Still has lots of tread life. These are my favorite tire. The mid side knob between the center end edge ones provides a great amount of additional traction that high roller 2s can't touch. These are my go to tire. Great tire. Very good grip in any kind of trail conditions. Climbs will even through muddy trails. Holds well on corners. Just yesterday, I was going downhill through a tight curve, I felt the bike slip a bit, but the side front knobs held me from crashing. Couldn't be happier with it. I ride in both loose rocky/sandy areas, and loamy/wet slippery root areas, and these tires have gripped well in both. No tire will every be able to make up for rider error and grip all the time so don't expect never to wash out again, but these tires have gotten me through some gnarly stuff that I thought for sure the tires would let go on. If they do slip it's only briefly and then they find grip again. I had wanted to give the Nevegals a try for awhile now and I'm so glad that I did. Unless you are a purist XC racer or gravity rider, this tire will not disappoint. It's a fantastic all around tire. I would ride this tire FOREVER! Been riding nevegals for quite some time in 26ers, this 27.5 did not disappoint. Great tires and work very well in the Hudson Valley (NY). They take a beating and provide great traction in various terrains (rocks, trunks, hard pack, soft pack, clay) and conditions (wet, dry, muddy, frozen). I do best with them slightly under recommended pressures, but that does exacerbate the main drawback of this tire - high rolling resistance. You will notice this tire requires more effort than others and lowering the psi makes it worse. I gladly pay that price for the added confidence it gives me. When dialed in, you feel glued to the ground. More than half my group has switched to these based on their performance. That says a lot considering I'm a middle-of-the-pack rider. Great front tire! Used the 26" for many years, and the 275 (2.35 width) just rolls very nicely over rough terrain and corners well. A great tire for the front, corners on rails! Great price as well! good grip on dry and loose dirt to wet and slippery. THE BEST tire. Stickey compound. Does wear quick. BUT - Really like this tire. It will not set up tubeless! So go buy the tubeless version. Great tires with excellent traction! Made a big difference for me. This tire is an old pal. Never disappoint. Buy it if you know it! I ridden a lot of version of this tire and it is the stiffest one I have used. I think the claimed TPI is false. I'm 225 and I have lowered the PSI to 30 in the front and 33 in the rear. Grips in the corners but steep climbs it loses traction when I don't think it should. Nice tire, especially when they're on sale. Delivery/service was excellent as always from Jenson. I really like these tires. I bought them for $32 so the price is unbeatable. However, I would've not bought this brand / tire if it wasn't on sale. Still one of the best tread patterns. 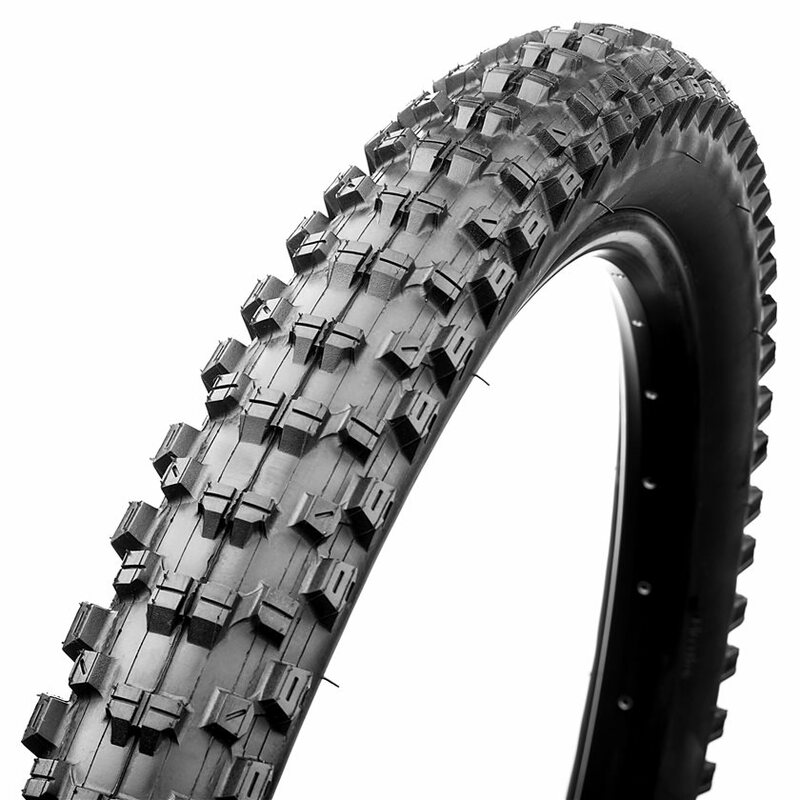 The Kenda Nevegal is one of the best tread patterns of all time. The tread pattern still holds it own after years and years even when many other companies developing new technologies in tread patterns. Very good grip and predictable grip when cornering. Braking is good with the tire. Works well in pretty much all conditions except mud. There are a couple things that are not so great. It is not a fast tire, but I will take good traction over speed any day for a trail/enduro type tire. Can be used as front or back tire. Weight is not the greatest. I used the Kenda Nevegal for years until I went 27.5 and they didn't sell it in 27.5 for a long time. Also, they have been slow to reintroduce it as tubeless. My The Nevegal X is not as good as the original Nevegal. It is good to see that they have it in 27.5 and starting to make it. I just hope they can improve it by making it lighter to around the 800s gram area to be competitive with other tires in its class. Havent used my 27.5's yet, but been using the 26 version for many years. Been stockpiling for next change as present tires slip more. This is a great tire at a good price. Durable and has good traction. These tires are awesome. I've used them for years. They inspire confidence in slippery corners and have excellent traction. They have a fair amount of rolling resistance but that's OK. The only down side is that they grip too well. I constantly get hit with rocks that the tire literally grabs from the trail and hucks at my shins. If you are doing a 26 to 650b conversion, the 2.1 Kenda is the ticket. Its low profile and low knobs help clear most rear triangle yokes. This is a great tire and the 27.5 X 2.1 was key for my 650b conversion rear tire. It handles great and feels beefier than a 2.1 tire. Plus it is a great value. As always Jenson was great. My first choice to buy from when I can. Great tire for the roots/rocks/mud/wet of NH. These were a huge improvement over the Shwalbe Racing Ralphs (the ralphs may be a great tire, but not up here in NH where traction is key). A very good all around tire. Running these tubeless on ZTR Crest rims with no issues. Finding that these perform best up here in NH at ~26psi. Lower than that they get a little squirrely (especially at higher speeds), higher than that too rigid. Overall, great tire and will buy again. For this item, you list "27.5x2.35 DTC/STC" as an option. Looking at the Kenda web site, this looks like part #212224 which is the tubeless option for this tire (STC indicates the fluid-based tubeless option). But on your product page you only list Kenda part numbers 212207, 212208 and further down is the statement "Kenda does not endorse the use of any fluid-based sealant products in any Kenda tube-type or UST tubeless tires", but their own web page indicates that the STC is in fact fluid-based sealant compatible. So is this the STC tire (#212224) or not? BEST ANSWER: The page contains both the STC and non STC versions of this tire, hence the Kenda disclaimer about not endorsing the use of sealant. When making a choice in the drop down menu, select the 27.5"x2.35, dtc/stc folding option. That is the sealant compatible version and is indeed Kenda part no. 212224. I get confused and I still don’t know if they are tubed, or tubeless? I keep hearing all the SCT stuff and all, but I still hear people asking about tubeless conversions. I still can’t yet figure it out. BEST ANSWER: I bought this tires few months ago and I have tubeless rims, so I used it tubeless. It’s a great tire.